CAR WASH Magazine: How's your omnichannel? In 2017 and beyond, successful business will showcase bold, innovative approaches to personalize and elevate every aspect of the shopping experience. How do you measure up? 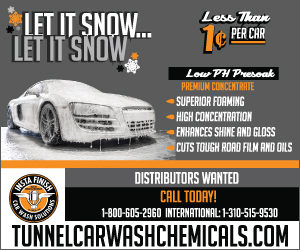 Check out more in this article from the latest issue of CAR WASH Magazine. Visit http://www.nxtbook.com/naylor/ICWQ/ICWQ0117/index.php#/26 to view the full article online. Look inside a modern car, and you’ll see many of the same materials that formed the earliest automobiles. Leather, wood, metal and cloth convey a sense of luxury, a connection to the beloved way things were. You may see synthetic stuff too, materials born of the jet and space ages. Visit https://www.wired.com/2017/05/tomorrows-cars-wont-just-drive-theyll-feel-different/ to view the full article online. V2I (vehicle-to-infrastructure) technology will soon come to fruition on a three-mile stretch of Michigan's I-75. The state's department of transportation and 3M will begin work on the communicating road within the next few months, breaking ground for what could eventually be a sweeping movement across the states. Visit http://www.thedrive.com/tech/10577/michigan-and-3m-are-building-a-road-that-talks-to-your-car to view the full article online. The continuing evolution of the modern automobile is arguably one of the most exciting and most important developments in the tech world today. In fact, it’s probably one of the most important business and societal stories we’ve seen in some time. Visit https://www.recode.net/2017/5/23/15681058/digital-car-automotive-industry-software-designed-disruption to view the full article online. Super Sonic Car Wash bought Mr. Bubbles locations in North Columbus and Starkville in 2016 that have served the Golden Triangle since 2007. Since then, plans were announced by the business to expand coverage in Columbus with an east side location coming Nov. 1. Visit http://www.cdispatch.com/news/article.asp?aid=58391 to view the full article online. A&B Collision of Clearlake, California, recently broke ground on a new facility that the co-owners promise will be better for customers, employees and the environment. Visit https://www.bodyshopbusiness.com/new-ab-collision-facility-will-feature-car-wash-uses-recycled-water/ to view the full article online. In my line of work, I do a lot of listening to managers bickering about losing good employees. It's understandable — turnover is costly and disruptive. So many of them will point fingers somewhere, but the data I receive from exit interview reports, feedback instruments and employee engagement surveys has fingers pointing back at them. Visit https://www.inc.com/marcel-schwantes/why-do-people-really-quit-their-jobs-heres-the-entire-reason-summed-up-in-1-sent.html?cid=hmside1 to view the full article online. Spiritual guru Deepak Chopra is a big believer in the power of the mind-body connection. It influences everything he does, from his teaching and writing to his spiritual practice and his fascination with wearable technology. Visit https://www.entrepreneur.com/article/294881 to view the full article online. Father’s day, which is just round the corner, is all about emotions and expressing love and gratitude towards your dad. And it is this emotion on which various industries like hospitality, travel, retail, consumer services, etc., have been banking their email marketing efforts on, so as to achieve a booming ROI. Visit http://www.business2community.com/email-marketing/30-effective-fathers-day-email-subject-lines-01849724#H702GogystDLw1pJ.97 to view the full article online. Small businesses often strain to look big and grow big. Big businesses have a different problem. They may have to struggle to retain the essence that made them appealing while adapting to stay both relevant and competitive. The creative firms that work with these giant companies are on the front lines of this endeavor. They are tasked with helping to bring new products to market while keeping big brands fresh. The following are some key lessons a few of these creative agencies can offer, based on their experiences working with the most successful brands in the world. Visit https://www.forbes.com/sites/kateharrison/2017/05/30/5-small-business-marketing-lessons-from-billion-dollar-brands-paypal-gap-google-and-more/#7b02bf5a6dc1 to view the full article online.